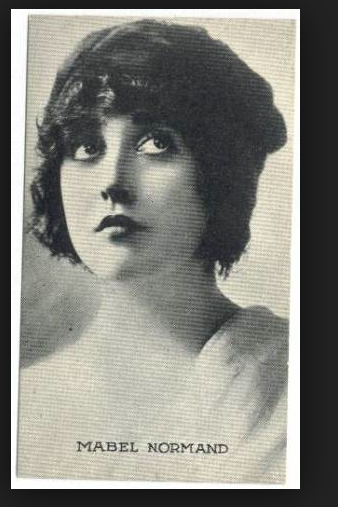 In 1922, silent film screen actress and comedian Mabel Normand (1892-1930) lived in Altadena, residing in a house on Foothill Blvd (now Altadena Drive). Normand began her film career making a name for herself in slapstick comedy. She helped Mack Sennett launch Keystone Studios where they produced Keystone Cop comedies. 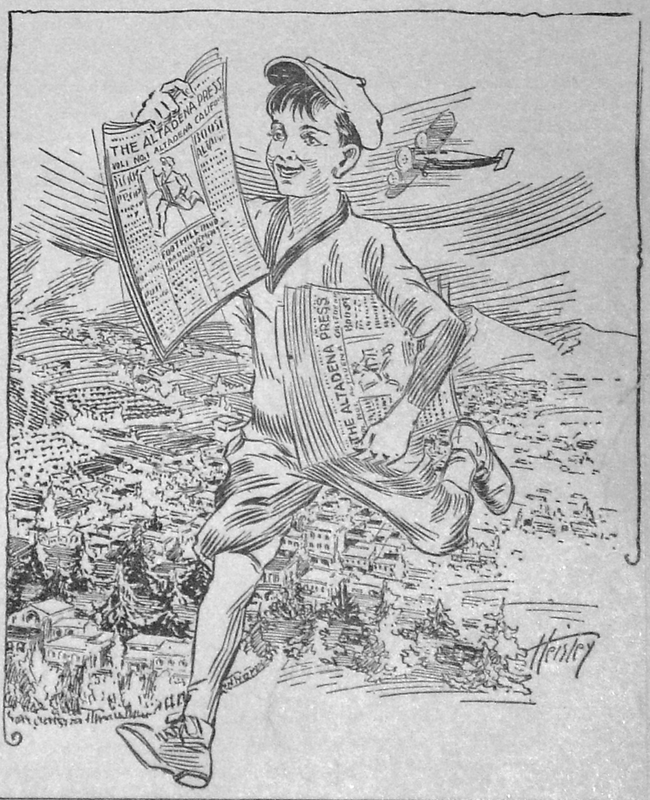 Normand also wrote and directed many of Charlie Chaplin's earliest shorts, often acting in them as well. In 1916, she opened her own production company and studio. 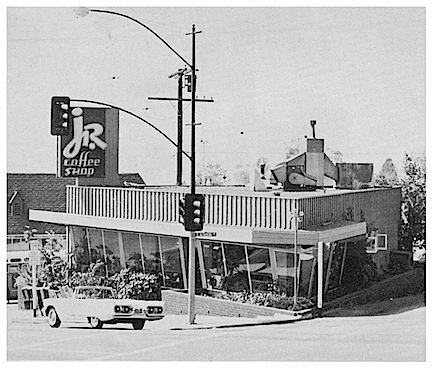 Although this little pie-shaped building on North Lake Avenue has served as a real estate office and seen its share of struggling restaurants, in the 1960s it was the successful "J.R. Coffee Shop". The diner was one of three restaurants that made up a small chain called "The Headliner" on Pasadena's Colorado Street between the old Star-News building (hence the name) and the Presbyterian Church. A long time Altadena resident said "It was a hamburger, fries and milk-shake kind of place, much like Bob's Big Boy. I ate there often with my family. It was so nice to have a local diner." Today it's the location of the popular restaurant, El Patron. This photo is from our archives. 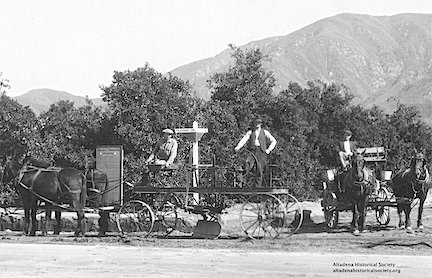 The workers are posing with horse-drawn road grading equipment. The street sign says Piedmont and Glen Avenue. 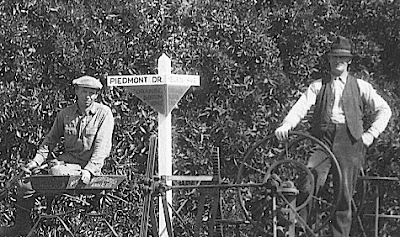 Piedmont was renamed Foothill, and finally Altadena Drive. The citrus orchard was being graded for the Orange Blossom Homes subdivision. If you go north on Glen Avenue from Altadena Drive, the houses on the street are part of the Janes' development, built after World War One. Glen Avenue is a few blocks east of Lincoln. 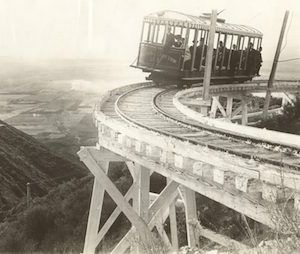 Below is a photo of the same shot as it appears today. 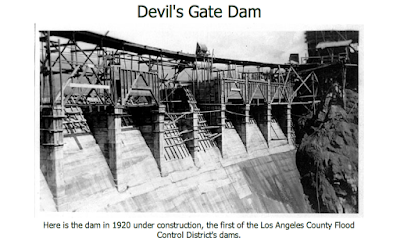 Built in 1920 by the Bent Bros Company, the Arroyo Seco's Devil's Gate Dam, was the first flood control dam in L. A. County. 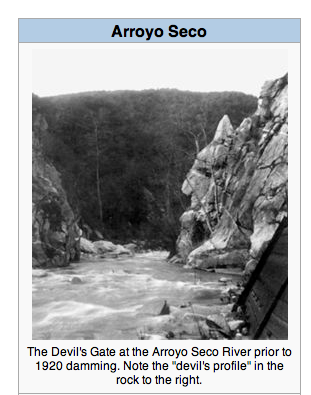 Its construction followed the devastating 1914 flood that sent dozens of homes down the arroyo. except for graffiti looks the same as in this photo. 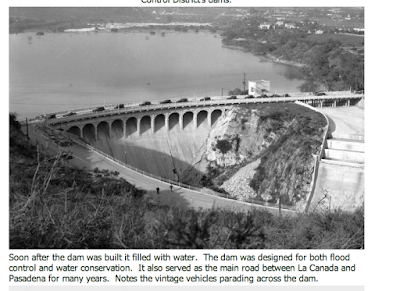 The dam soon after it was built in 1920. 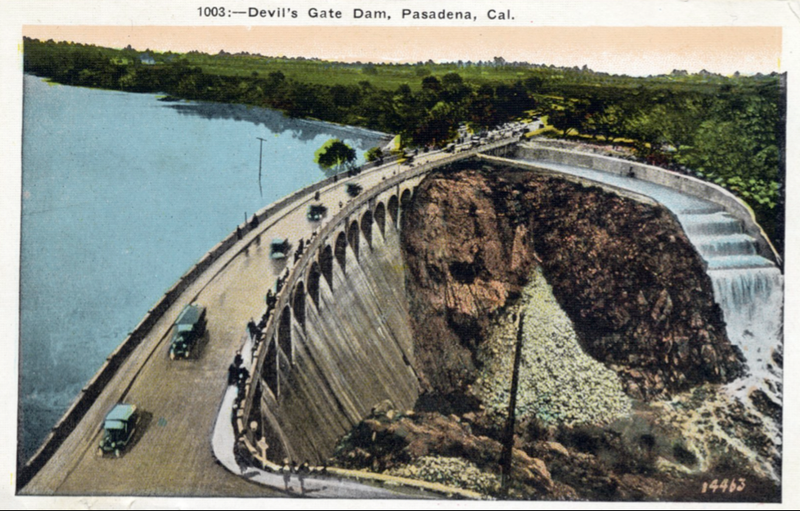 The dam as it appears today. 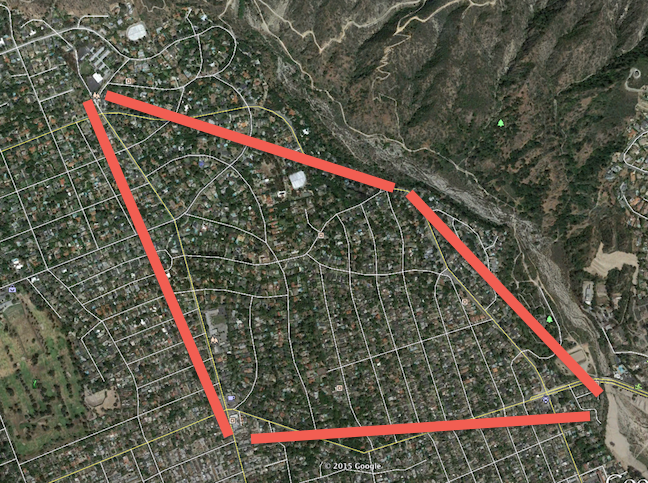 Connecting Altadena to La Cañada Flintridge, the structure spans the narrowest place in the Arroyo Seco watershed at Devil's Gate Gorge named after the shape of the rocks. 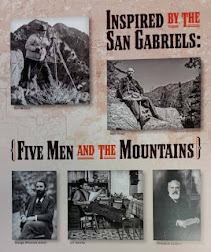 The watershed begins at Red Box Saddle in the Angeles National Forest near Mount Wilson in the San Gabriel Mountains. 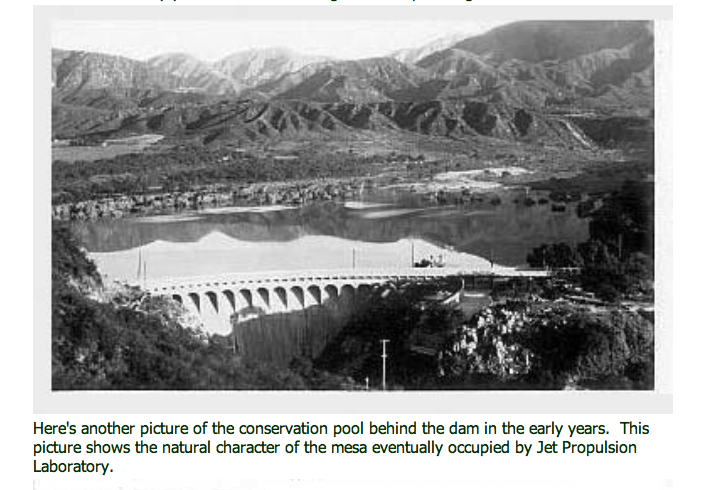 Although the dam was primarily built for flood control, the reservoir was used for recreation until the Sylmar earthquake compromised the integrity of the concrete structure in 1971. 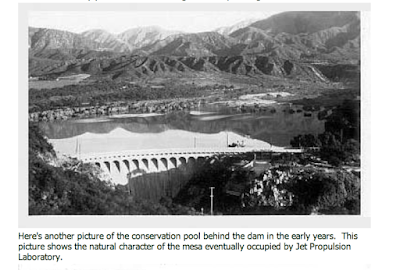 Photo taken soon after the structure was completed. 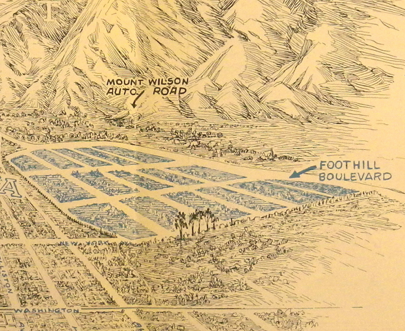 When the first section of the 210 freeway opened in 1966, the road was largely circumvented. Today the old road is closed to motor vehicles and is enjoyed by recreational enthusiasts and dog-walkers. 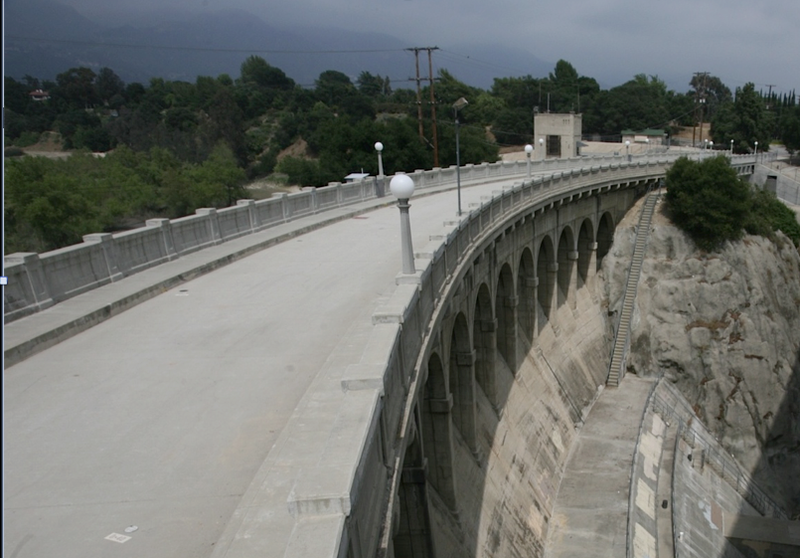 A series of plans to manage the Arroyo Seco watershed near the dam have been established. 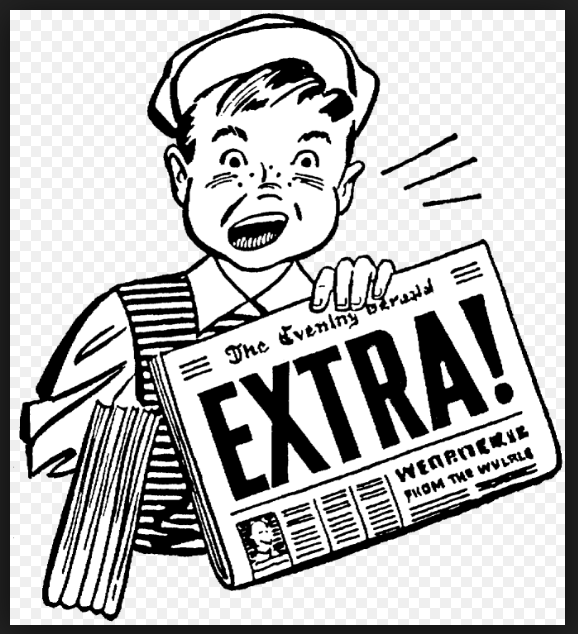 The Los Angeles Times published an informative article about the controversy surrounding the cleaning out of the debris basin. The star of author Naomi Hirahara’s series of award-winning mystery books, Mas Arai, is a Japanese gardener living in post-World War II Altadena. 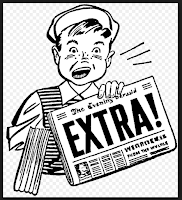 Now, Ms. Hirahara will speak on her childhood years in Altadena and the experiences of Japanese-Americans in 20th century Los Angeles, at 7:30 p.m. Monday April 25 at the Altadena Community Center, 730 E. Altadena Drive. 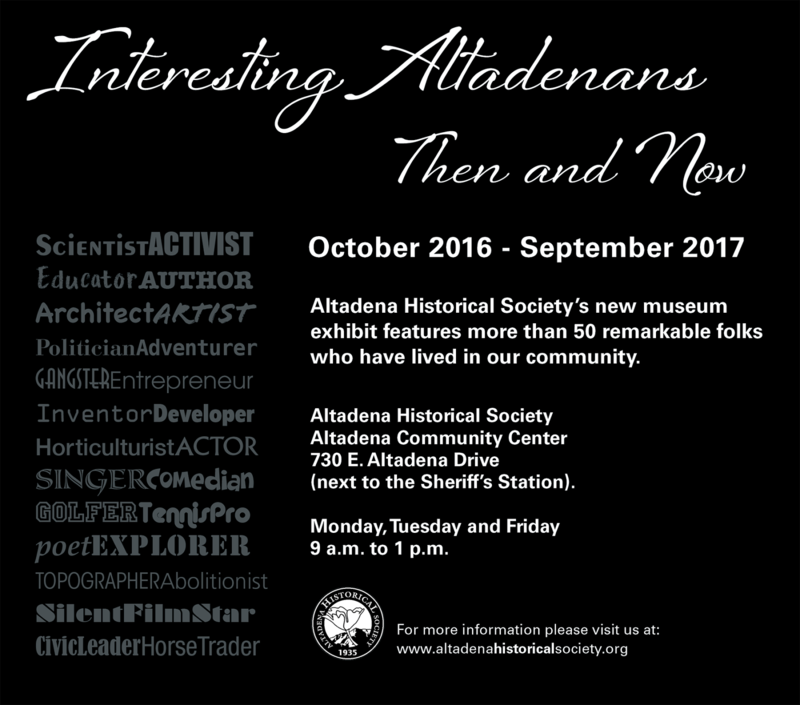 The free, illustrated program, open to the public, is sponsored by the Altadena Historical Society. 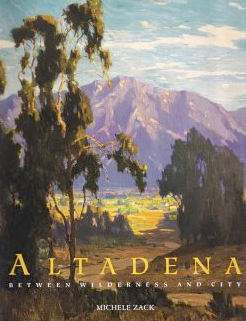 “Altadena had a small community of Japanese immigrants and their families, with a church and at least one business, in the pre- and post-war years,” said Jane Brackman, Ph.D., president of the Historical Society. “Ms. Hirahara has woven her experiences and memories of those years into her books, and we are honored and delighted that she will share them with everyone on April 25,” Brackman said. Hirahara is the author of five books in the Mas Arai series, with the sixth--”Sayonara Slam”--due out in May. 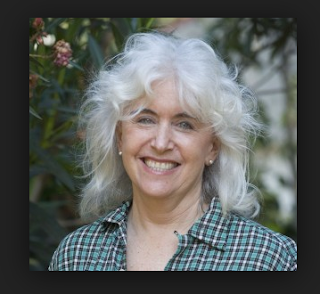 She also has authored two mystery books featuring a Los Angeles bicycle policeman. Hirahara was born in Pasasdena in 1962, and lived in Altadena with her family until they moved to South Pasadena in 1971. She still lives in South Pasadena. Her father was born in California, but was taken to Hiroshima, Japan, as an infant, and was only miles away from the epicenter when the U.S. dropped the atomic bomb there in 1945. Her mother, born in Hiroshima, also survived, but lost her father in the blast. After the war, her father returned to California and eventually established himself in the gardening and landscaping business, as did so many other Japanese-Americans after being released from the camps in which they were incarcerated during the war. 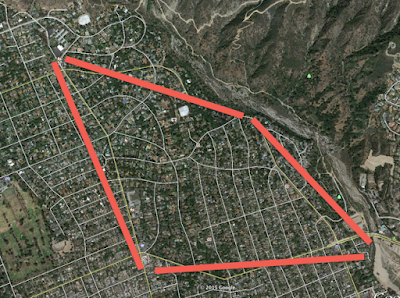 Naomi and a younger brother were raised in Altadena and then South Pasadena. She graduated from Stanford University, and was a reporter and editor for Los Angeles’s Rafu Shimpo Japanese newspaper, covering the reparations movement for Japanese-Americans forced from their homes and businesses and incarcerated during the war, as well as the L.A. riots and their aftermath. In addition to her mystery novels, she is the editor of “Greenmakers: Japanese American Gardeners in Southern California;” an award-winning book for young adults; and several biographies and histories. She will bring several of her books to the April 25 program for sale and autographing. 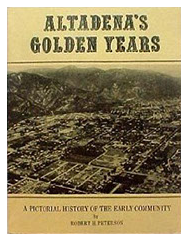 Altadena Historical Society has its offices and archives in the Altadena Community Center, and is open 9 a.m. to 1 p.m. Mondays, Tuesdays and Fridays, and by appointment. The current exhibit at the society is “Altadena in the Rose Parade,” which will run through June. As this brochure from the AHS collection indicates, in the 1920s development real estate agency Rigali & Vaselish purchased land from the Allen family who owned Sphinx Ranch, and paid $1800 and acre. 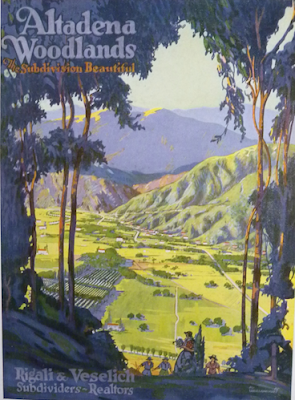 "The first portion of Altadena Woodlands offered for sale was sold out within five weeks, gross sales titling over four hundred and fifty thousand dollars. 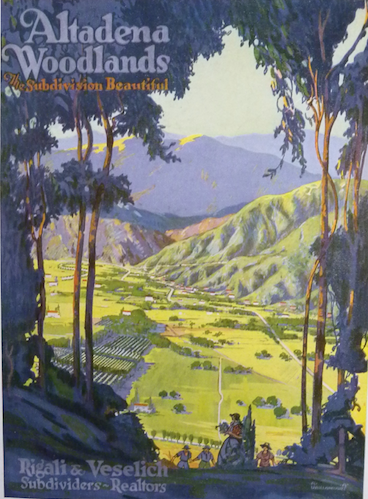 The instant public approval accorded Altadena Woodlands as shown through the tremendous volume of sales in a short space of time demonstrated the high character and desirability of the homesites offered and brought out the fact that at the prices offered, the discriminating realty buyer recognized an investment opportunity. You are invited to investigate. Branch office Phoone colorado 2748, Main office Phone 875-633"
and was bordered by New York Avenue on the south. 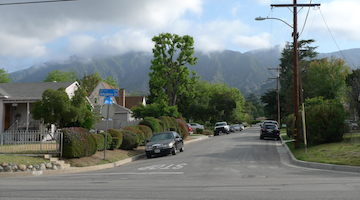 and Altadena Drive as it appears today. 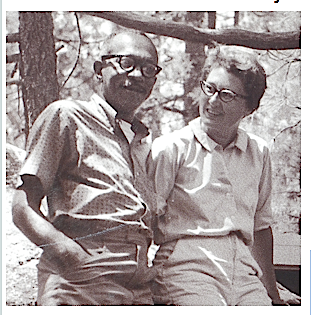 Artist Charles White (1918-1979) and author/educator Frances Barrett White (1926-2000) were married in 1950. Frances wrote Reaches of the Heart in 1994, a loving literary tribute to her husband. Noted painter and lithographer, Charles White was a significant part of the twentieth century social realist art scene. The book is an endearing love story, and an intimate picture of what life was like for an interracial couple in a world not ready to accept such a union. The family eventually moved to Altadena, where they were active in civil rights issues and the integration of local public schools.